Contemporary Literary Review India (CLRI) is one of the leading literary journals in India and attracts a wide audience each month. It attracts 500,000 page views annually. If you search with the keywords: literary journal, literary journals India or similar keywords, CLRI will appear on the first or second page on any search engines including Google. CLRI has been appearing for more than six years now and comes out in two editions, online and print, with separate ISSN. It has published thousands of emerging and established authors from around the world. Our print edition is circulated to various authors in India and abroad, to various libraries in India, is listed on various online bookstores for sale as soft copy and paperback copy. CLRI is listed, indexed, archived or mentioned with many reputed literary directories, repositories, and many universities in India including Avicenna Scientific Index, CiteFactor, Directory of Abstract Indexing for Journals, DRJI, EBSCO, Electronic Journals Library, General Impact Factor, Google Scholar, Index Copernicus, JGate, OAJI, Pune University, Vidya Sagar University, WorldCat, WZB, Berlin Social Science Center, ZDB and many others. Listing is ever increasing. CLRI has strong editorial polices. Although we strive to publish as many authors as possible, we publish about 60% of all the submissions received for each of our online issues. And only 40% for our annual print edition. Because of this standard, we have received strong Publication Impact Factor of 3.475 by International Institute of Organized Research (I2OR). Subsequently, we have also received I2OR - Publication Excellence Award 2017 that shows our high standard in the area of publishing. We don’t receive any monitory help from any source. It is absolutely my literary endeavor with a hope to promote authors in any possible ways I find suitable. At the same time, for last few years, we have also been receiving good help by authors. They purchase a good number of print copies each year. I aspect you will help us this year too by buying a few copies from us. 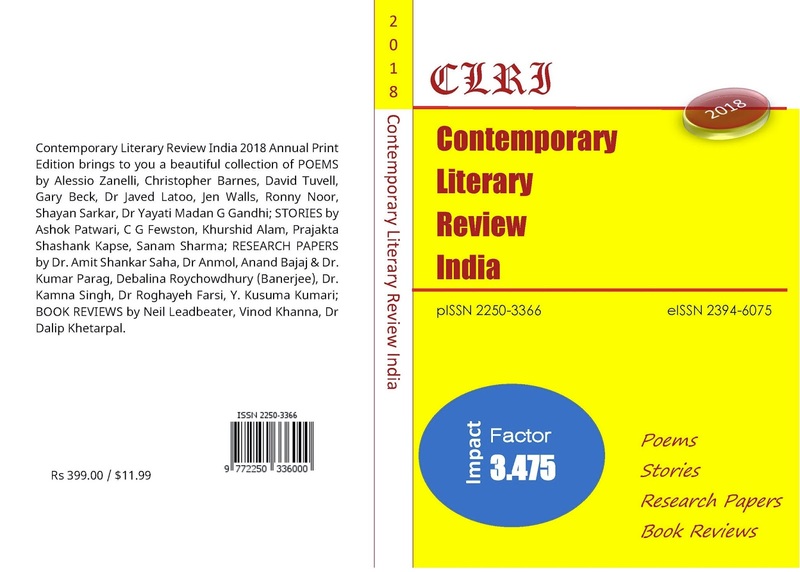 One print copy of CLRI 2018 costs Rs 399.00 / $US11.99 including shipping charges. Authors from India should pay Rs 399.00 for one copy (and calculate the total cost for as many copies as you buy). Authors from aboard should pay $US11.99 for each copy and calculate the total cost for as many copies as you buy. Oversea authors can pay us through PayPal (email address for PayPal payment: clrijournal@gmail.com). Authors from India can pay us to our bank account. 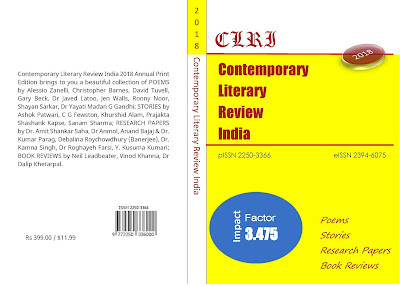 Contemporary Literary Review India (CLRI) Annual Edition 2018 is an incorporation of four assorted literary genres; Poems, Stories, Research Papers, and Book- reviews. The ‘Poetry Section’ endows with metaphysical, veracity, delicate contemporary pieces of limerick. The Story Section offers fascinating first hand narratives on diverse subject matters with distinctive techniques whereas the third section of this edition is raging with contemporary literary terms and literary techniques like Existentialism, Alienation, Diaspora, Psychoanalytical Studies, Marginalization of Women and Masculine Culture and many more. This edition has really turned into a show-ground of immense literary activities. A wonderful and outstanding journal that incorporates many genres of literary creations catering to all sections of the society in India as well as abroad.